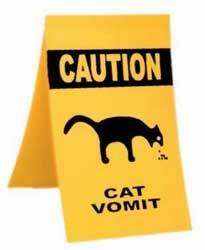 Cat vomit on your carpet is always unpleasant but it could be a sign that your cat may be unwell. However cats do tend to vomit from time to time and may just be caused by a hairball and this is not something to worry about. The problem is knowing the difference. So is it a sign of a serious cat illness for which your pet may need some urgent treatment. Or is your cat simply getting something bad out of their system? Either way, as a caring owner, the more you know about the treatments available and the possible causes for cat vomit, the better you will be able to help your pet. 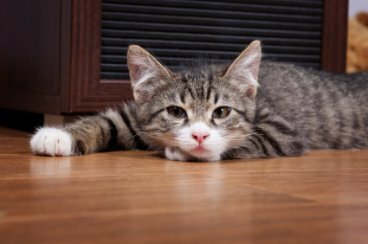 This page will take you through the various things you can do for your feline friend to prevent further sickness. What To Do About Cat Vomiting? If your sick cat has vomited 2 or 3 times in about 8 hours (and as long as there are no other accompanying symptoms that suggest more urgent attention by a vet is required) then keep them indoors and give them small amounts of water. If they bring this back as well, then restrict their fluid intake to give their stomachs a rest for another 3 to 4 hours. But do watch out for signs of dehydration (see our other page about cat vomiting here). Then try a tablespoon of water every half hour or so. If they seem okay with this, you can try re-introducing some food. Keep the amounts very small to start with and make sure the food is very bland, such as some plain lean chicken (no skin), with some mashed up boiled rice or potatoes, or possibly some low fat cottage cheese. Alternatively you can buy specially prepared food for a convalescing sick cat. If your pet responds well to this, then you can re-introduce their normal diet gradually over the next day or two. If however, the vomiting returns, or other symptoms of cat illness appear, then you need to take them to the vet for proper investigations. Once the initial episodes of vomiting have finished and the animal is back to eating more solid food, it can help to re-look at their diet and ensure they are following a well balanced and nutritious regime suitable for their circumstances. Your vet can advise if there are any special requirements, for instance if they have particular gastrointestinal sensitivities, intolerances or even allergies that may be affecting them. Any period of stomach illness can upset the balance of digestive enzymes and healthy intestinal bacteria that are necessary for good gut health in an animal. Recurrent episodes of vomiting or diarrhea can become a chronic problem where the animal always appears to have an over sensitive or weak digestive system. To help their cats overcome such repeated stomach problems, some pet owners find it helpful to supplement their pets diet for a period of time to help restore this natural gastrointestinal balance. 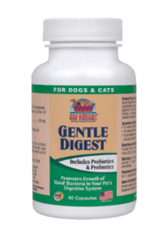 For example, the Ark Naturals Gentle Digest for Dogs & Cats available from Pet Wellbeing help achieve this. Okay, but if the problem has been more urgent and they have had to go to the vet, what will they be able to do for them? What Can Your Vet Do To Find The Cause? Your vet will take a medical history and ask lots of questions about the cat vomiting, such as, has there been a change of diet recently, and have you noticed any other signs or symptoms of cat health problems (such as we discuss on our other page). They will feel the cats abdomen for tenderness or swellings and do a physical examination. They may take their temperature and take blood tests. They may want to take urine and faeces samples for analysis. They may want to send your sick cat for scans and x-rays. Lastly they may need to perform an endoscopy (where they pass a camera inside to look for signs to make a diagnosis) or even a laparotomy, which is an exploratory operation to find the cause of the problem. How Will The Vet Treat This Vomiting? Any treatment will obviously depend on the cause, and eliminating that cause will be the main purpose. Your vet may wish to administer subcutaneous fluids to prevent dehydration and give anti-emetic (anti sickness) injections. In more serious cases, hospitalisation may be necessary if close observation and intravenous medicines and fluids are needed. Can Cat Vomit Be A Sign of An Underlying Disease? Tumors of the stomach or intestine. Inner ear disease (as it affects balance). ........the list can go on and on. So if you are concerned that your cat vomiting is for more than the usual simple reasons that we discussed before, please take them to your vet to get the condition investigated and treated properly. It is always better to be safe than sorry where cat health is concerned!